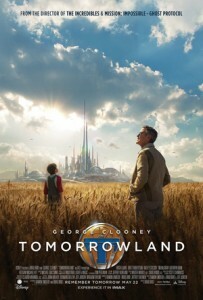 Tomorrowland is about a place that only a select few are allowed to go to, Frank Walker (George Clooney) went and was kicked out, now Casey Newton (Britt Robertson) gets her chance to go there. In Tomorrowland, events affect our world and vice-versa, but as to the extent… that’s up to our main characters. The film is co-written and directed by Brad Bird. This entry was posted in Movies/TV, Reviews and tagged britt robertson, disney tomorrowland, disneyland, george clooney, hope, hugh laurie, michael giacchino, movie review, raffey cassidy, sci-fi, tomorrowland, tomorrowland movie, tomorrowland movie review on June 4, 2015 by Eugene.